With the first World War II winter 1939/40 a long cooling period commenced. It was the only one since the end of the Little Ice Age. Was WWII a vast geophysical experiment, which man undertook unintentionally? Was naval warfare a leading force in this experiment? The Atlantic served as battle ground for more than 5 years, the Pacific in the west of Hawaii for almost 4 years. The sea was churned and turned about by huge armadas, and billions of explosive charges that penetrated the sea surface. As a matter of fact the temperature statistics commenced to drop accordingly. James Hansen’s view has been the text book explanation and leading opinion since long. A major piece of conventional climate wisdom widely attributed the cooling to air pollution, which reached record levels in the industrialized world after World War II. For many years it looked as if science considered the matter as settled. Is that going to change in the future? 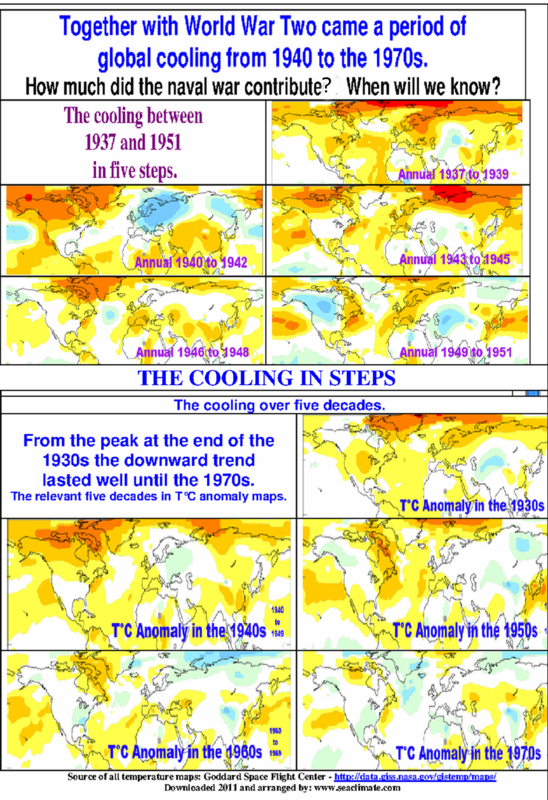 At least, the temperature trend images for European countries, as shown in A2 and Fig. G1-(8-11), correlate the cooling to Atlantic rather than to inland regions. (Title): When the North Atlantic caught a chill. Surface cooling could have pushed down temperatures in the Northern Hemisphere 40 years ago. (1st sentence): Three-tenths of a degree may seem a small dip — but, for climate researchers, the discovery that a large patch of the ocean cooled by 0.3 °C within a few years around 1970 is a small sensation. That is by far not the full story of the physical force that had been unlashed by a huge number of shells, bombs, torpedoes, depth charges, by the ship stores, general cargo and the oil from sinking ships and tankers, or shot down bombers and fighter planes that penetrated, exploded, or polluted the sea at the sea surface and down into many sea layers, that changed the temperature and salinity structure at millions and millions of locations at sea. Thousands of naval vessels, mine sweepers, and merchant ships sailed trillions of miles leaving in the wake a sea body churned over a depth down to a dozen meters. That was a huge physical force effecting the marine environment that had never happened before. It was a factor that influenced the condition of the atmosphere as well. The sea makes the climate. Some more information on military strengths and results are outlined in the next section. The climatic shift in the middle of the last century eventually became an acknowledged global issue, when the world felt confronted with lower temperatures and a cooling down trend. 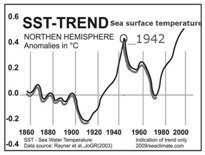 Actually since WWII the temperature in the Northern Hemisphere had merely decreased by 0.2°C. That was a very low figure, but this drop was big enough to be felt and subject to concern. There are ominous signs that the Earth’s weather patterns have begun to change dramatically and that these changes may portend a drastic decline in food production– with serious political implications for just about every nation on Earth. The Earth’s climate seems to be cooling down. · Christian Science Monitor, Aug. 27, 1974 (Earth Seems to be Cooling Off Again). Such statements seem to indicate that the scientific community only starts getting to the point. 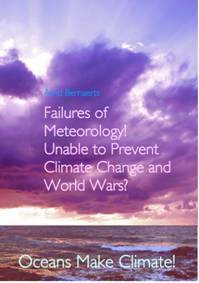 The main effort of the pervious chapters was to show that the three extreme war winters in Europe would not have turned out as the coldest in North Europe for a century without the activities of a naval war in the regional seas since September 1939. It was not natural, it was man who brought about the extreme winters, including the winter 1941/42. Had the war stopped before the third full war year had ended, the warming trend until 1939 may have resumed immediately, and the world would, most likely, never have recorded a cooling phase of three decades. But it was not to come about. Since December 1941 the naval war went global. A global cooling became evident. It was the only cooling period over a longer period of time the world had seen since the end of the Little Ice Age and during the 20th Century. Global naval war started with the attack of Japan ’s navy on Pearl Harbor on December 7th 1941 . The mainly European war theatre during the first three war years immediately covered the entire North Atlantic, and very soon also the Pacific from Hawaii to Singapore . The previous three war years had seen a huge development of new, more effective weaponry, and an enormous increase in numbers due to mass production. That actually increased many fold when the United States jointed the Allies as a war party on December 8th 1941. Within a short period of time the USA set up an armada of unprecedented size and power. Since December 1941 huge sea areas were churned and turned up-side-down over depths even hurricane wind force do not have any compareable equivalence. 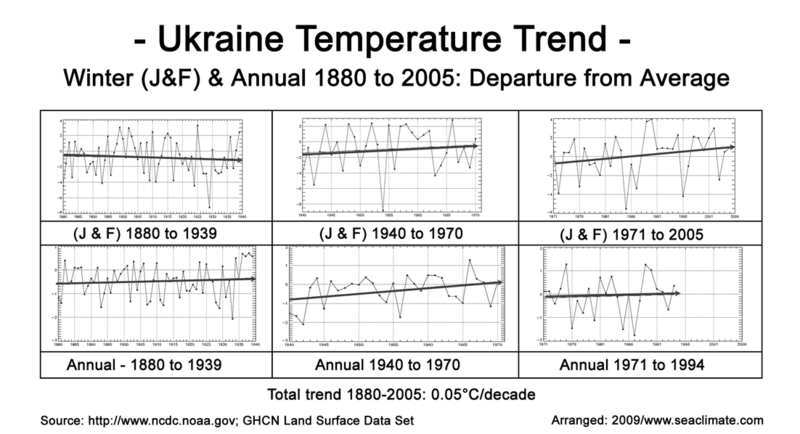 Has the global temperature turn-about anything to do with global naval war activities? 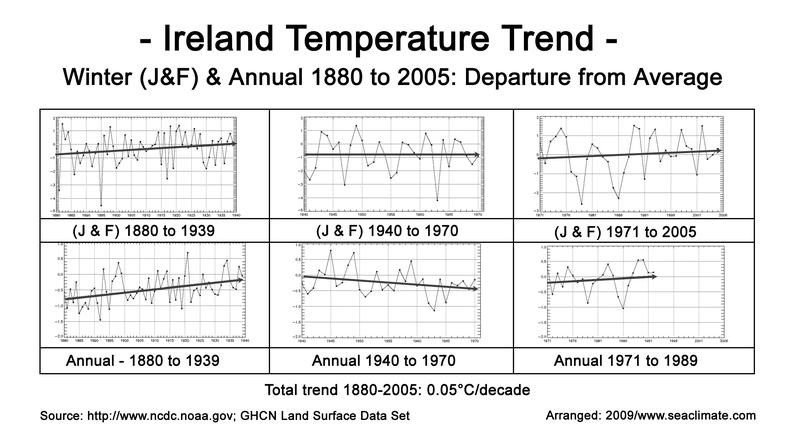 Did these activities contribute to the end of the warming trend, and commencement of cooling? Was it ‘natural variability’, sun spot activity, ENSO, suspended particles, or the sea? For an answer it seems not so far fetched to consider a major contribution of the Atlantic and Pacific to atmospheric conditions in the Northern Hemisphere. The contribution of naval war at the onset of the climatic shift is quite certain. Whether naval war played any role in the cooling after the war had ended is not an issue to be proven here. It is enough to indicate that it is not impossible, and that the role of the oceans in the three decade lasting cooling receives more attention. Eventually a thorough explanation is needed, in a not too distant future. c. What are David Thompson et al. talking about? __The twentieth-century trend in global-mean surface temperature was not monotonic: temperatures rose from the start of the century to the 1940s, fell slightly during the middle part of the century, and rose rapidly from the mid-1970s onwards. __The warming–cooling–warming pattern of twentieth-century temperatures is typically interpreted as the superposition of long-term warming due to increasing greenhouse gases…..
__Here we show that the hemispheric differences in temperature trends in the middle of the twentieth century stem largely from a rapid drop in Northern Hemisphere sea surface temperatures of about 0.3°C between about 1968 and 1972. __The timescale of the drop is shorter than that associated with either tropospheric aerosol loadings or previous characterizations of oscillatory multi-decadal variability. __The drop ……..is not linked to any known biases in surface temperature measurements. __The drop is….. is largest over the northern North Atlantic . “year-to-year variability induced by a variety of physical processes, notably: changes in the Northern Hemisphere high-latitude wintertime atmospheric circulation that modulate the strength of the advection of warm, marine air masses over the cold continents; the El Niño Southern Oscillation (ENSO) cycle, which modulates the exchange of heat between the atmosphere and ocean; and/or volcanic eruptions, which inject long-lived, reflective sulphate aerosols into the stratosphere”. "The spatial and temporal structures of the drop in NH - SH sea surface temperatures suggest that the hemispheric differences in surface temperature trends during the mid-twentieth century derive not from hemispheric asymmetries in tropospheric aerosol loadings, or oscillatory decadal variability in the ocean. Rather, the hemispheric differences seem to derive in large part from a discrete cooling event in the Northern Hemisphere oceans that was not geographically localized, but had its largest amplitude over the northern North Atlantic ." The work is an interesting development, as it is raising attention towards ocean-atmosphere dynamics. It is an important development challenging the by far too narrow view concerning the impact of aerosols after WWII, by pointing to the timescale of the drop, which is considerably shorter than that typically associated with either tropospheric aerosol forcing or oscillatory multi-decadal SST variability. On the other hand the paper is at best an initial step in the right direction, but fails to see the broader picture. 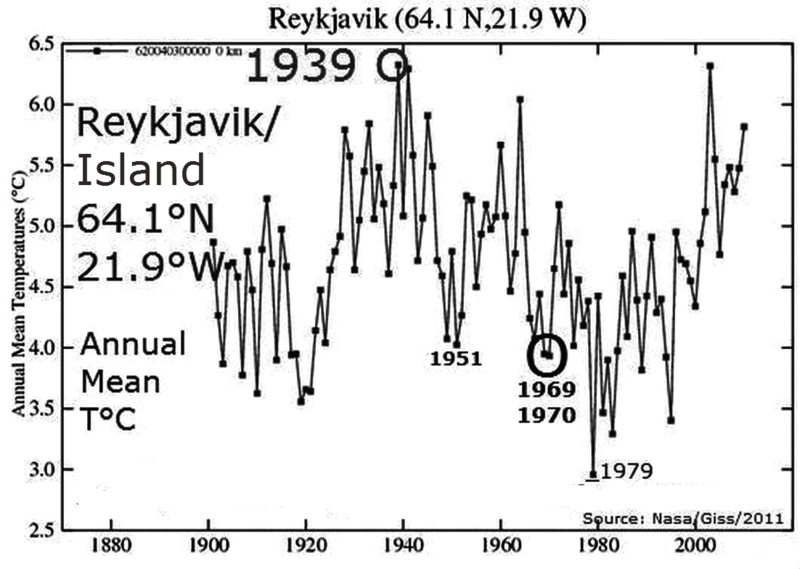 Although it made the observation that there had been two temperature drops, one in 1945 and the other around 1970, they ignore the first drop and restrict the investigation on the latter event. If they regard the 1970’s event as an oceanic issue, why do they not consider it also as the source and reason for the earlier event? A link between the first and second event three decades later is inevitable. 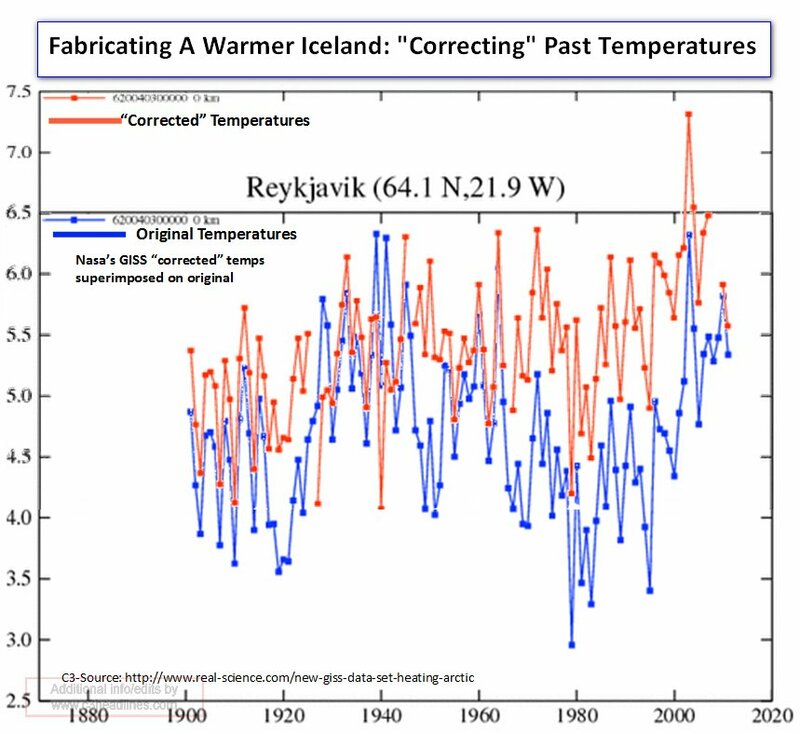 One needs only to take a look at the temperature situation at Reykjavik the capital of Iceland (see Fig. G1-1, p. 161). The air temperatures there are closely linked to the condition of sea water temperatures. The record is, at least from a naval war perspective astonishing, with a dramatic rise at the end of the 1st World War, and a significant decrease since the onset of WWII. Of the three phases until 1979, the first from 1939 to 1951 is the most pronounced. Is that mere coincidence? Scarcely! 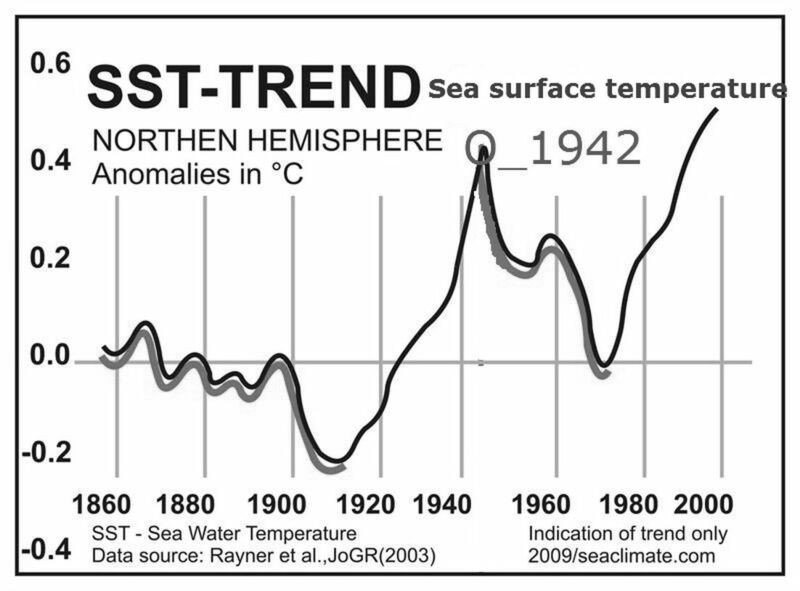 Thomson at al (2010) claim that: “Northern Hemisphere SSTs did not oscillate continuously on multi-decadal timescales, but rose steadily throughout the twentieth century apart from two discrete events: the drops in 1945 and around 1970.” The latter date is of little interest here, as this investigation searches for clues about what caused the global cooling in the mid or last century, the former date is chosen sloppily. This date can be challenged for two principle reason. There is foremost the general unreliability of sea surface data that have been taken during the war years. They are so much out of tune with pre and post war data, that any ‘correction’ is mere speculation. Most of the raw data sets showed a stark variation during the early 1940s. There is the sudden jump around 1941. As far as Thomason’s material show a sharp decrease in 1945 (Thompson Fig. 1), this is neither reflected in IPCC Report (WGI, 2001) (see: Fig A3-9), nor in the work by Rayner et al. (2003), Fig. G1-5, above. 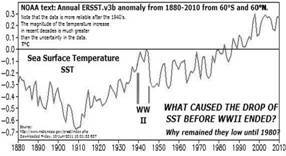 Thomson et al ignore this information, which are not only based on SST. They seem to have paid no attention to data from the close-by sea station. 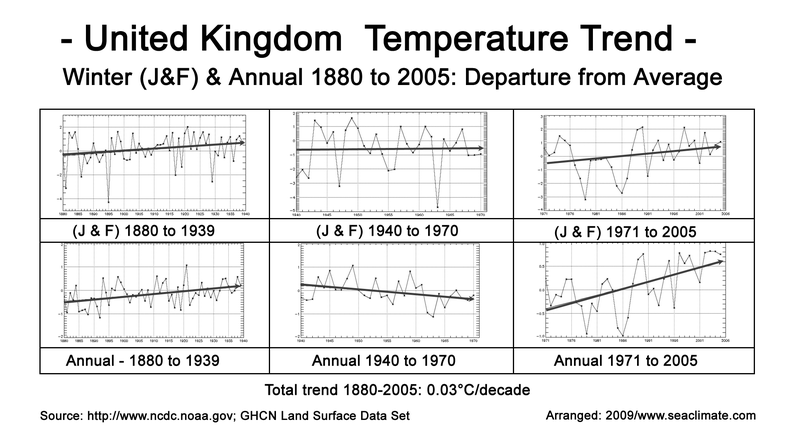 But Thompson et al should have looked at information beyond temperature data, before claiming a drop occurrence in 1945. There are not many observations but there are enough to indicate that the climatic change commenced together with WWII. There is, for example, the situation in the Arctic . 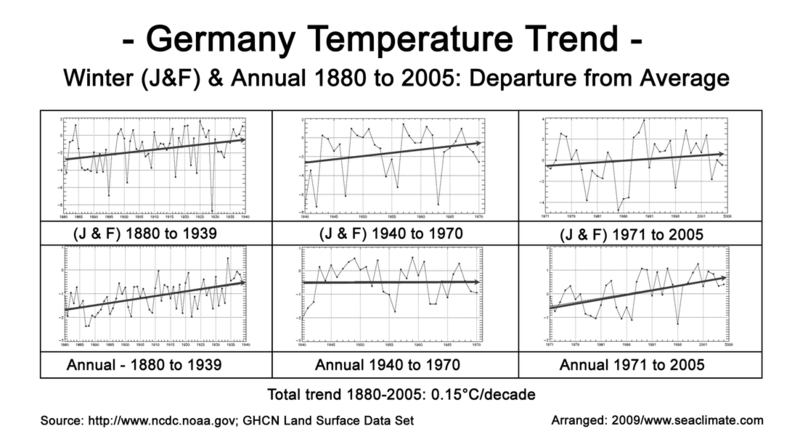 A strong rise of temperature since winter 1918/19 came to a halt in winter 1939/40 and reversed. This close relation raises the question of the role of naval warfare in the Arctic issue, which unfortunately can not be discussed here. Climate is all about water! Excerpt from L. Gimeno, et al. (2011), EOS/AGU, Vol.92. __Globally, the hydrological cycle is characterized by the evaporation of about 500,000 cubic kilometers of water per year, of which 86% is from the oceans and 14% is from the continents [Quante and Matthias, 2006]. · Only about 0.001 percent of the total Earth's water volume is in the atmosphere. The volume of water in the atmosphere at any one time is about 12,900 km3 . The entire water in the atmosphere is replaced about 35 times in one year. Each water drop (vapor) in the air remains there for not more than about 10 days. The ocean mean temperature is about 4°C. __Most of the water that evaporates from the ocean (90%) is precipitated back into them, while the remaining 10% is transported to the continents, where the water precipitates. About two thirds of this precipitation is recycled over the continents, and only one third runs off directly into the oceans. __Water vapour concentrations decrease rapidly with the height. __Near the surface, where most water vapour resides, concentrations vary by more than 3 orders of magnitude, from 10 parts per million by volume in the coldest regions to as much as 5% in the warmest [Quante and Matthias, 2006]. 3 times as much water vapor as the extratropical. __In the midlatitudes the water vapor distribution is subject to intense day-to-day variations, responding strongly to the passage of cyclones. Antarctica , weaker developments of anticyclones over the continents and more northwards cyclone paths. These dramatic changes were reflected by a dramatic warming of the arctic and of the North Atlantic, and aridity of the south central part of North America and Eurasia . Conversely, recent decades have exhibited opposite trends: weakening planetary circulation southwards shifts of ice boundaries and cyclone paths and sharp cooling and different rain pattern over the continents”. Kelly et al (1982) confirm the year 1940 as a year of change. The Northern Hemisphere warmed from 1880 to 1940 by 0.7°C and then fell to 0.2°C by the 1960s, whereby low and middle latitudes underwent a cooling during the period 1951-1975, the higher latitudes cooled until the mid-1960s after which slight warming occurred. There are other indications that something special happened as well. Already mentioned was the very significant increase of cyclonic density in the mid Atlantic region at the early phase of WWII (see: sec. A2h, p. 10). 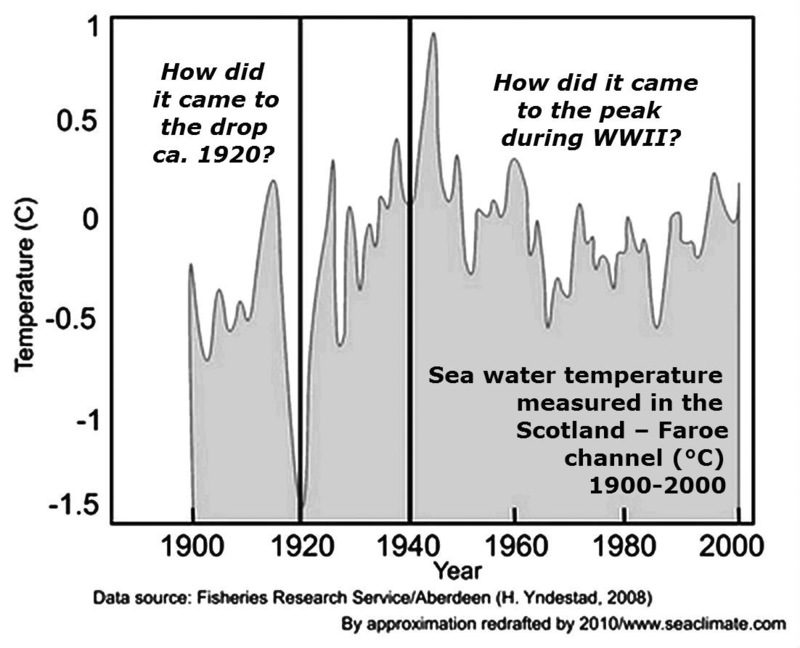 Another example is the extraordinary rise in sea temperature in the Faeroe Channel during WWII, as shown in Fig. G1-6. In conclusion it should be obvious that it is irresponsible to ignore naval war as a contributing factor to the global cooling phase from 1940 to almost 1980. Particularly a link to the initial phase is established prima facie with the three extreme war winters 1940, 1941 and 1942 in Europe . And if naval war had been part of the climatic change during these three years, it is hardly a serious opinion to regard naval war over several years in the North Atlantic as a climatic neutral exercise, and scientifically a failure either not to see this, or to ignore it altogether. It is not about a question whether it has actually been a small, medium, or bigger contribution, and at what time. Naval war contributed, and this fact needs to be part of the climatic change debate. e. Too curious? Or, towards new thinking with the jellyfish? · "Some scientists are skeptical that the process plays an essential role in the mixing of the oceans. However, should further evidence confirm this, it should be based on modeling effects that include the sea water mixing to simulate the past and future climate." It seems not too difficult to imagine that world shipping has a much more pronounced effect, and during war time the anthropogenic impact on the marine environment would literally explode. Figure G1-7 (UK); G1-8 (DE); G1-9 (IRE); & G1-10 (UA).// For further trend images see: Chapter A2 (pp. 3 -10). See the thorough discussion in the papers concerning the Pacific (Bernaerts, 1997) and with regard to the North Atlantic (Bernaerts, 1998).